Global growth surprised on the upside in 1H’18, lifting Asia/Pac’s export growth to 10.9%yoy in 1H’18 after a 10.4% rebound in 2017. However, the synchronised recovery across all 36 OECD economies and the main emerging markets that drove the 2017 rebound is fading. In its place is a surging US economy driven by a late cycle fiscal stimulus (the tax cuts, particularly for fixed investment). That’s likely to see US inflation rise, as shortages of labour and materials build. Apart from Japan, which is briefly running hot, the picture in other big markets is muted. China is worried about growth slipping, as it clamps down on excess leverage and Europe’s upturn, while good, is becoming less buoyant. One outcome is the US Fed’s lonely march to higher interest rates, which means that the recent upswing of the US$ could accelerate in 2H’18. 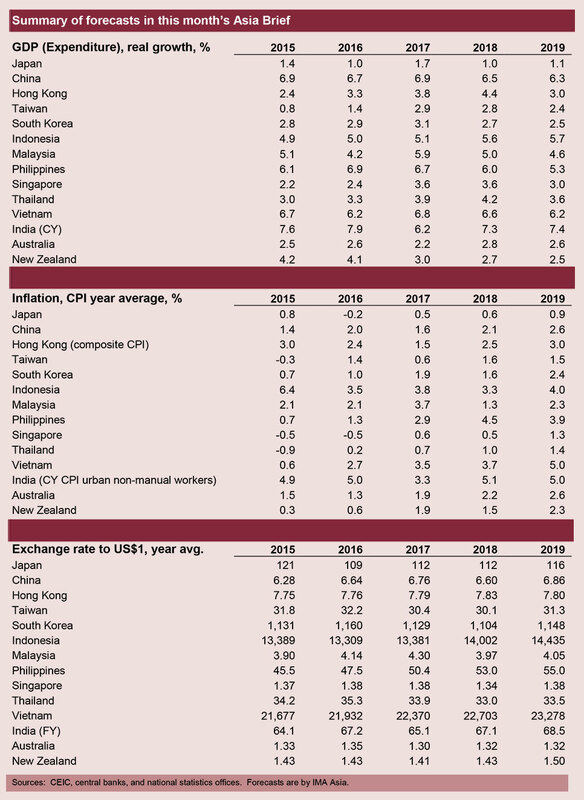 The three takeaways for Asia are to prepare for export growth to ease, to prepare for a rise in financial market volatility, and to watch for continued falls on a rising US$ for some Asian currencies, with the Philippines, Indonesia, and India being most exposed. The A$ and NZ$ are also exposed to falls, as their respective interest rate differentials with the US Fed rate have disappeared. Strong, if lopsided, growth is not the story in newspapers, which are searching for the impact of US trade wars with Europe and China. So far that impact is sector specific and sporadic, although it could snowball. Our clients report two developments. One is the dumping of China goods that were bound for the US (but are now uncompetitive after new tariffs) into SE Asia from early July. The second is supply chain relocation for US-bound goods from China. Western MNCs are assessing alternative production sites and one client reports meeting a PRC firm that has moved production to India and is seeking all Indian materials. We expect some form of resolution of the current disputes in the next 6-8 weeks in time for US mid-term elections in November. However, commercial nationalism (mainly trade, investment, and technology) is on the rise and supply-chain restructuring will continue. Euro area growth has been slower than that of the US, but it has had a strongly positive impact on demand for goods from Asia. Euro area growth has been slower than that of the US, but it has had a strongly positive impact on demand for goods from Asia. GDP data is available to Q1’18, with growth of 2.5%yoy thanks to a 3.6%yoy lift in fixed investment. Consumer growth was cooler than in the US, at 1.6%yoy in Q1’18. Moreover, consumer sentiment, retail sales growth, and new car registrations all eased in Q2’18. However, growth in goods imports for the first five months of 2018 was much stronger than in the US, with a 17%ytd rise after import growth of 9.7% for full 2017 (all US$ basis). Policy realignment in China dominates the region’s outlook, as Beijing continues to drive deleveraging (mostly in real estate, construction, and local government) alongside massive restructuring of its industrial and financial sectors. Deleveraging in China means slower growth in China’s capex, GDP, and imports, and that means lower global growth with weaker demand-side pressure on resource prices. However, July saw a slight easing in the deleveraging campaign, which is a plus for China’s 2H’18 growth and for Asia’s growth. The industrial restructuring is focused on reducing the role of low-value added and polluting industries and promoting the growth of high value-added industries. Apart from changing China’s industrial landscape, it is pushing some industries - like furniture, clothing and footwear - into South and South-East Asia (garbage recycling is also being forced to relocate but has just been barred in Thailand). This is a plus for other emerging markets in Asia who can move up the low-end of the industrial value chain. India and Indonesia are less than year away from national elections. President Joko Widodo (Jokowi) in Indonesia and PM Modi in India are both under pressure to deliver on their election promises of reform-driven growth. Jokowi is putting the emphasis on a big infrastructure program. Modi would like to do the same, but his construction sector is bogged down in debt, so he is reverting to tax cuts and handouts. Fortunately, these look well timed for a cyclical upturn in growth. Both leaders are expected to win, although Modi faces a revived Congress-led opposition. Mid-term elections are also due in the Philippines next May, and that limits President Duterte’s scope for further reforms. He’ll give priority to getting TRAIN-2 passed, which is the second stage of his 5-stage overhaul of tax. That includes rationalisation of an array of tax incentives that helped win investment in business process outsourcing (BPO) and export processing zones where many MNCs have located. The battle over which incentives to cut will dominate Q3’18. With export growth for Asia/Pac lifting to 10.9%yoy in 1H’18 from 10.4% for full 2017 (US$ basis), the region is on track for a second year of strong growth. Asia stands out for its ability to drive growth equally from exports and local demand, and this year we’d expected the export engine to cool while local demand ran strong. Our growth forecasts are now edging up, as we find the export engine is running stronger than expected. That’s led to tighter labour markets, which is boosting capex on new equipment and supporting a lift in consumer sentiment and spending. Key beneficiaries are Japan, China, and Taiwan in north Asia, but oddly not South Korea (and this may be due to massive offshoring of mobile phone production to Vietnam). Most of southeast Asia is gaining a similar benefit except for the Philippines, where significant export manufacturing has failed to establish. Global demand is set to ease in 2019, which means slower export growth for Asia (around 5% from 9% in 2018 and 110.4% in 2017) and slower GDP growth. However, the drop in GDP growth will be minor for most countries, as firm local demand should remain supportive of top-line growth. Our regional total growth rate stays at 3.9% in 2019, as we expect growth to lift in India, which has upside potential to 8% from our current forecast of 7.4%, and Indonesia, with more modest growth of 5.7% expected in 2019 after growth of 5.6% this year and 5.1% in 2017. Remember, 2019 is an election year in both countries, so governments will aim to ensure that growth lifts. Two ASEAN economies face a steady slide in growth. The new government in Malaysia has stopped the constant voting-buying largesse of the defeated UMNO government. That means weaker consumer growth despite zeroing the GST on June 1. Capex growth will also slow, as all big projects are reviewed and then cancelled or postponed. A replacement of almost the entire top rank of the civil services will also slow decision-making. The Philippines is also slowing, with growth dropping from 6.7% last year to around 5.3% next year. The economy was overheating in 2016 and 2017, forcing inflation and the trade deficit up, and leading to a sharp fall in the Peso. Higher interest rates are needed and more cautious investors will contribute to slower growth. Parliament reconvened on July 18th for the Monsoon Session, which will run through August 10th, with a backlog of 68 pending bills. The focus is likely to be on the social ones – the National Commission for Backward Classes, Muslim divorces, surrogacy, medical education – which are politically important. The Government is also seeking to showcase itself as socially progressive by pursuing a soft line in defending the anti-homosexuality Section 377 of the Constitution, in a case being heard by the Supreme Court. With the 2019 general elections round the corner, such imperatives are likely to remain at the forefront while economic issues are temporarily relegated to the background. The immediate casualties include the disinvestment of national carrier, Air India, and the merger of three struggling state-owned insurance companies, which was intended as a precursor to their eventual privatisation. However, one area that continues to see forward effort is renewable energy. The Ministry of Power recently notified higher renewable purchase obligations (RPOs), the minimum amount of renewable power that distribution utilities are required to purchase, for FY20-FY22. From 17% in the current year, the RPO will increase to 21% of total power purchased by FY22. Additionally, the Cabinet approved phase III of the Off Grid and Decentralised Solar Applications Programme, a USD 275 million initiative to install 300,000 solar street lamps, 2.5 million solar study lamps and several small solar plants of 25kWp capacity aggregating up to 100 MWp, by 2020. Economic performance has picked up a few notches since the beginning of 2018-19 with indicators across the board registering improved scores. Passenger vehicle sales surged 20% yoy in May against 9% yoy last year while CV sales grew 43% against -6%. 2W sales increased slower at 9% yoy but that followed 25% growth in the preceding four months. Rural demand is also evident in the 20% yoy growth in tractor sales in April and May. Exports grew 20% yoy in May after averaging 9.5% last year, reflected in an impressive 7% increase in port traffic growth. From an investment standpoint, credit growth stood at 11% yoy in May, a 4-year high, while proposed investment aggregated Rs 4.4 trillion in January-May 2018, almost twice the level of the corresponding period last year. Together, these statistics reflect a broad-based increase in the growth momentum, a fact acknowledged by the markets which are once again approaching all-time highs. However, the economy continues to face risks from external factors, primarily the unwinding of US monetary policy as well as America’s recent tax reforms. The most obvious impact is by way of capital flows, with portfolio investors having moved USD 9 billion out of Indian markets in Q1, FY19 (April-June), causing the rupee to drop 5.6% in those three months alone. Cumulatively, the Indian currency has lost 7.8% since the start of 2018, a trend that is likely to continue in the short term, putting pressure on interest rates. The RBI’s 25 bps hike in June 2018 is only the first in a series of likely rate hikes over the next 12-18 months.